Renewable energy is obtained from sources that don’t run out such as hydro­electric, geothermal, wind, and solar. Renewable energy is becoming more popular as the technology improves and the cost comes down. The Miller Branch Library building has solar panels as part of its overall energy-efficient and green design. Designed to achieve LEED Silver Certification from the US Green Building Council, the green design includes 72 solar panels, a passive solar design which allows ample natural lighting, highly efficient HVAC and light­ing, water conservation features and a green roof. More information about the Miller Library building is available on the hclibrary.org webpage. 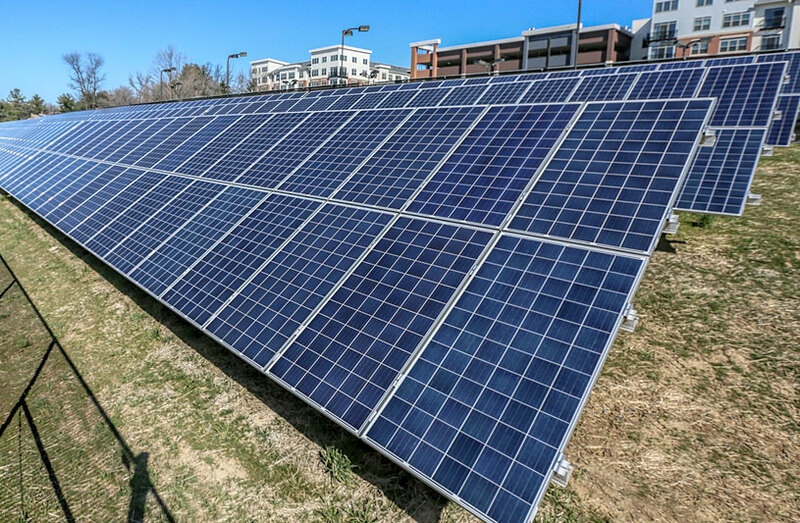 Howard County Library’s East Columbia Branch has 24 solar photovoltaic (PV) panels that were installed in 2008 as part of the County’s effort to incorporate solar power into county government operations. The system generates an average of approximately 500 kWh (kilowatt hours) a month – more in the summer and less in the winter. In the first month of operation, the solar array generated over 700 kWh of electricity which is enough to power 28 average-sized Howard County homes for one day. The average American home uses 920 kWh each month. Worthington Elementary School in Ellicott City now receives nearly 90 percent of its electrical power from the sun. Many local partners includ­ing the County’s Department of Public Works, the Howard County Board of Education, the Maryland Energy Administration, the Northeast Maryland Waste Disposal Authority and others worked together to place about 2,000 solar panels on a former landfill next to Worthington Elementary. The students at Worthington use the solar panels as a real-life example of new technology and energy production for the future. Solar panels were added during the renovation of the Howard Building and District Court building in Ellicott City. At the Howard Building the solar power “boosts” the water heating system. At the District Court, solar energy generates electricity used in the building. These projects reduce the amount of energy purchased, and serve as pilot projects to learn from. In September 2011, the County installed three solar power trackers atop existing light poles in the parking lot of the George Howard Building. These are Maryland’s first high-efficiency, small-footprint solar systems for electric vehicle charging. The Solar Power Poles incorporate a GPS-based controller to follow the movement of the sun throughout the day and produce up to 30 percent more power than fixed panels. The panels, which can be retrofitted to most existing lighting poles, utilize existing wiring and require no ground space connections. Power produced from the solar panels is converted to AC power and fed back into the utility grid. Geothermal energy, the energy stored in the earth, can be harnessed for heating buildings and water. Geothermal or ground source heat pump systems use pipes installed in the ground. Water or a mixture of water and antifreeze are circulated through the pipes to absorb heat from the surrounding soil. In hot weather, the process is reversed, cooling the house by using the ground as a heat sink. Ellicott Gardens, low-income one and two bedroom apartments owned and rented out by Howard County, were built to be energy efficient, keeping operating costs low. Completed in 2009, the apartment complex has a white roof that reflects heat, energy-saving windows and appliances, and low-flow plumbing fixtures. The main green attraction, though, is the wind turbine, that generates about 400 kwh of electricity per month. Alpha Ridge Landfill opened in May 1980. Trash buried in a landfill generates landfill gas as it decomposes. This landfill gas, which is approximately 50% methane, can be beneficially used to generate electricity. The landfill gas to energy system protects the environment by expending methane (a greenhouse gas). In addition, it off­sets the use of electricity generated from non-renewable energy resources. The electricity generated is used to power the landfill gas to energy system itself, the existing landfill gas collection and flare system, and a vehicle charging station. Any additional electricity generated is sold on the transmission grid to offset some of the landfill operational costs. 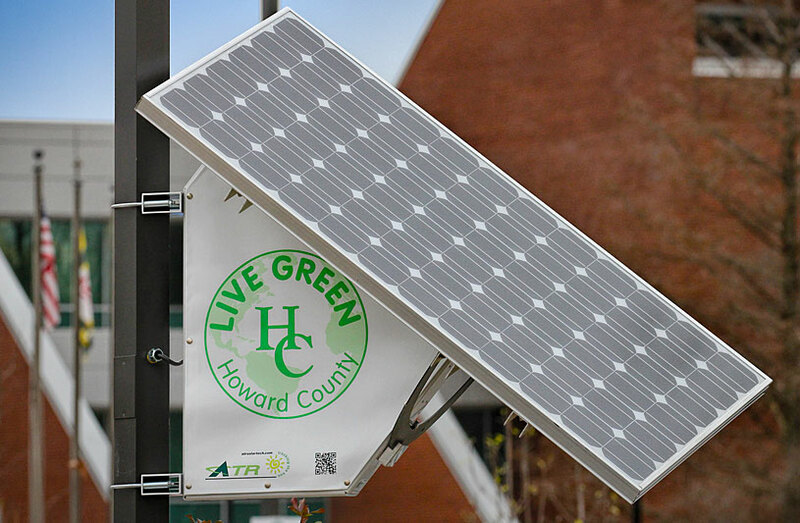 Howard County government purchases renewable energy through our group energy purchasing agreement. The state of Maryland Renewable Energy Portfolio Standard Program requires electricity suppliers to meet a prescribed minimum portion of their retail electricity sales with various renewable energy sources. Residents can encourage renewable energy by purchasing it through their electric company. BGE and Pepco allow you to change your energy supplier within their system.